The problem with the tropics is that jack o’lanterns aren’t really practical. Have you seen how fast a carved pumpkin rots in hot weather? Or even an un-carved one, for that matter. There’s a reason my husband has literally never carved a jack o’lantern! While I hope to one day introduce him to the fun of hollowing and carving out a pumpkin, for now we’ll have to make do with more durable, less traditional variants on the theme. 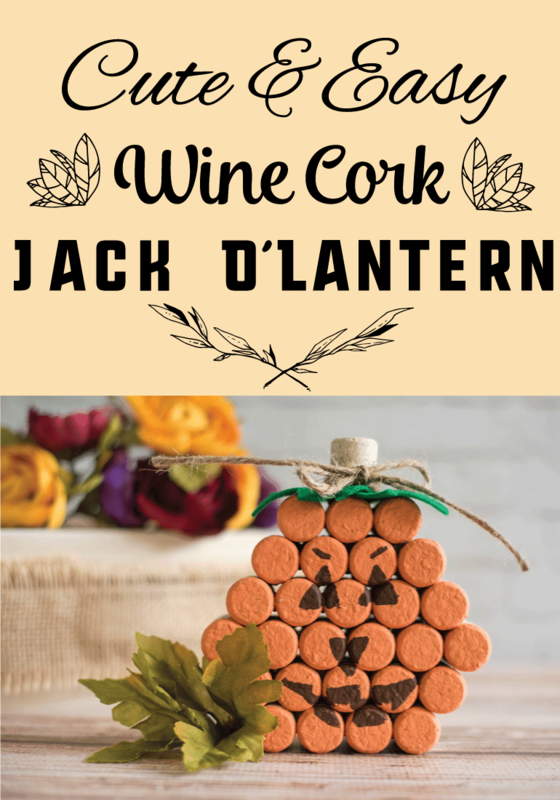 I hope you enjoy seeing how to make a wine cork jack o’lantern and can put the tutorial to use, whether you live in warmer climes or just want a cute decoration for your home! 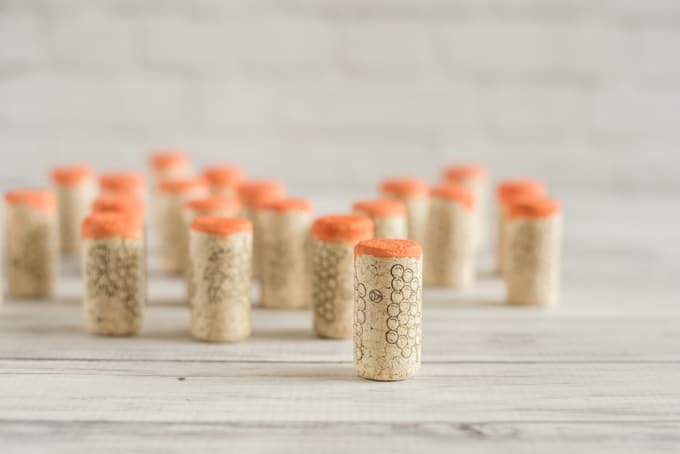 Corks! 28 of them. 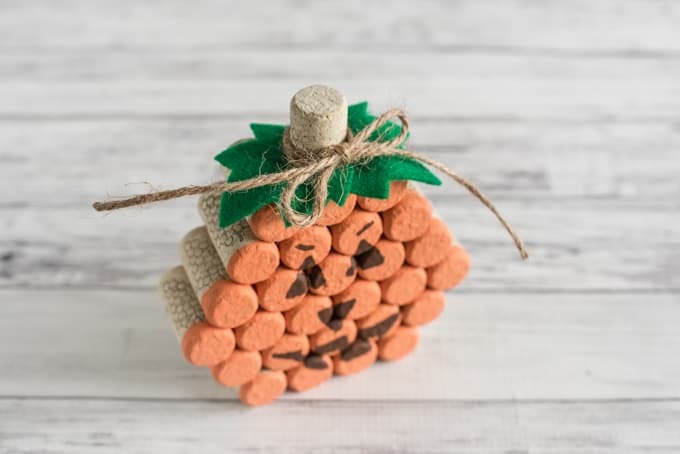 If you drink wine, you can hang on to a lot of wine corks to make this pumpkin, or if you don’t have that kind of patience you can be like me and buy them. 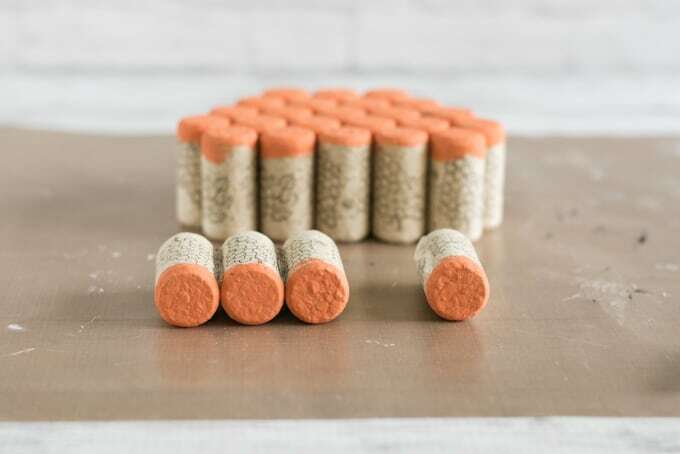 Because I also make/sell items from corks, I prefer to purchase unused corks like these ones. 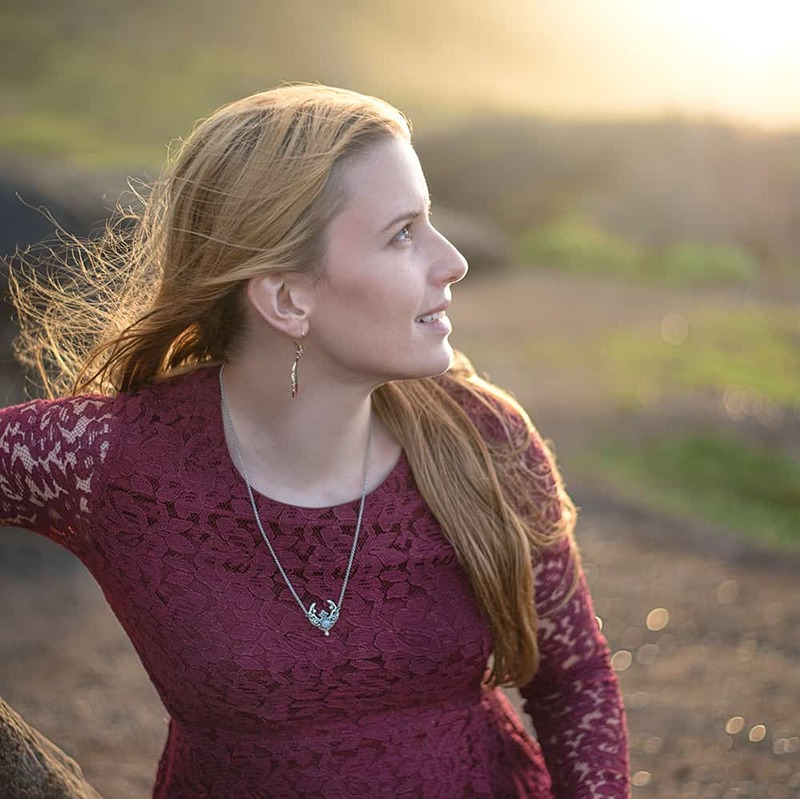 They are high quality and you don’t have to worry about them being all different sizes or already stained. Something to protect your work surface. A silicone baking mat or teflon crafting sheet is perfect! 1. 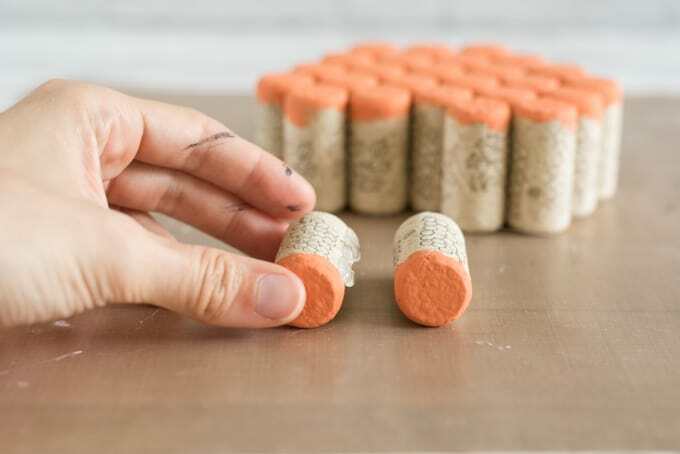 Set aside one of your corks and paint one end of each remaining cork. If you want, you can wait for them to dry, flip them, and paint the other side, but I made my jack o’lantern single-sided. 2. 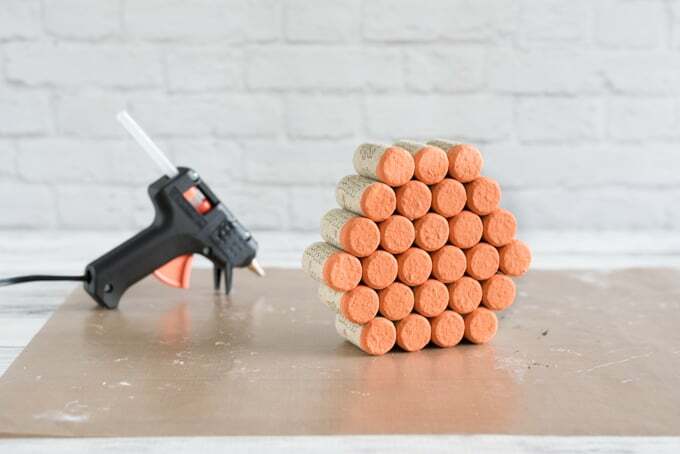 Plug in your glue gun and, while it’s heating, arrange your corks into rows, as shown. 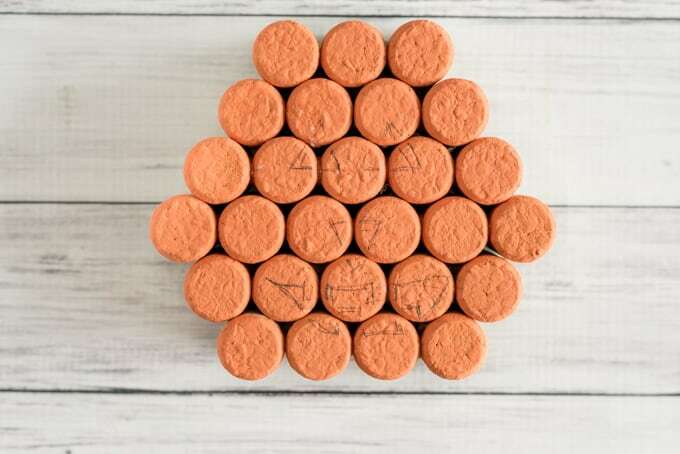 You should have rows with 4, 5, 6, 5, 4, and 3 corks lined up and ready to glue. 3. 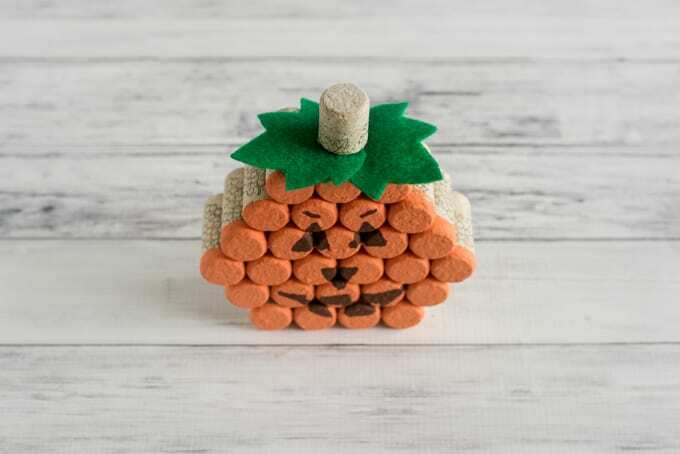 Start your pumpkin by grabbing two corks from your first row of 4 and gluing them together with a bead of hot glue. 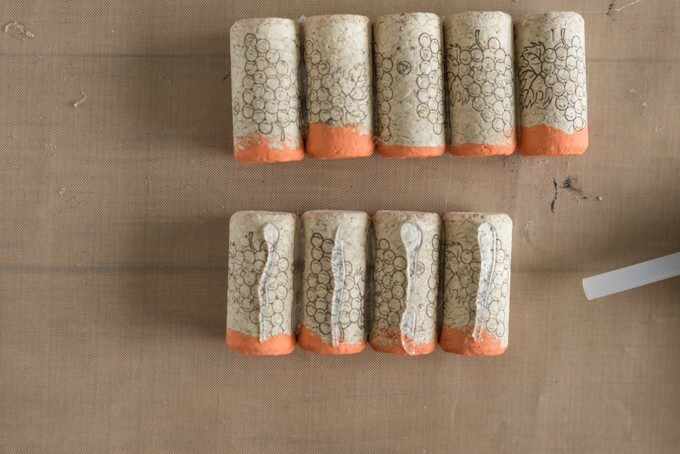 Make sure the painted ends are point the same way for both corks! 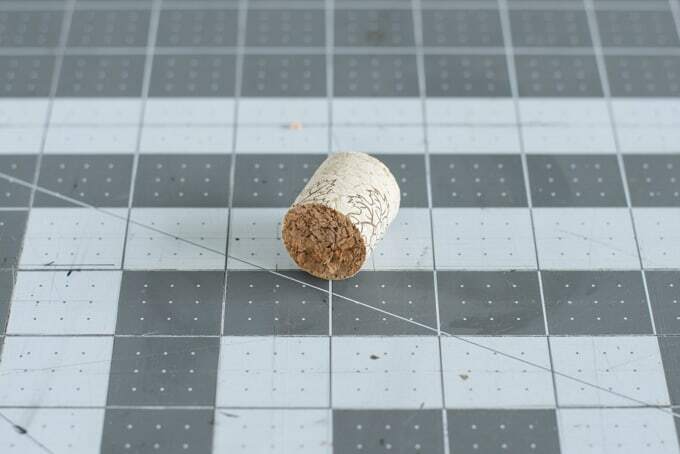 Grab the third cork from your row, add a bead of glue down one long edge, and add it on. Do the same with the forth cork. 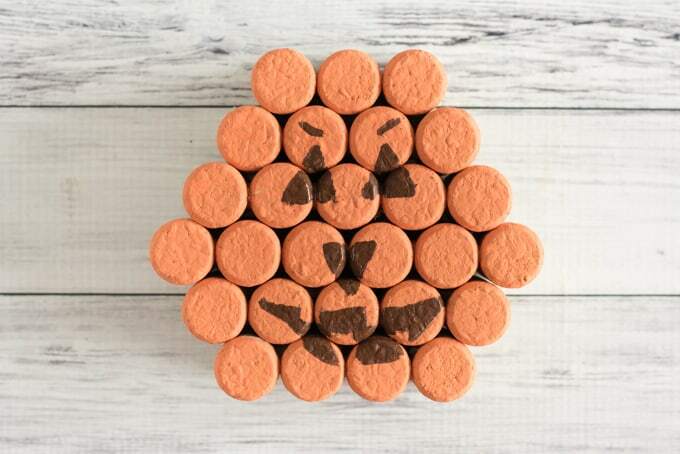 As you go along, try to line up the faces of each cork as evenly as possible! 4. 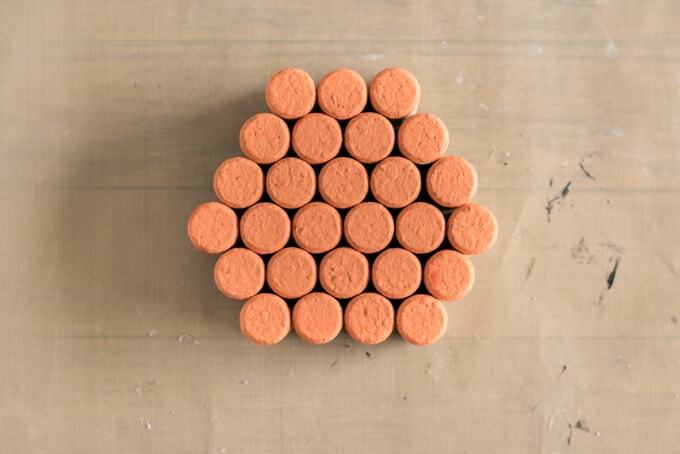 Keep gluing your rows of corks together in the same manner! 5. 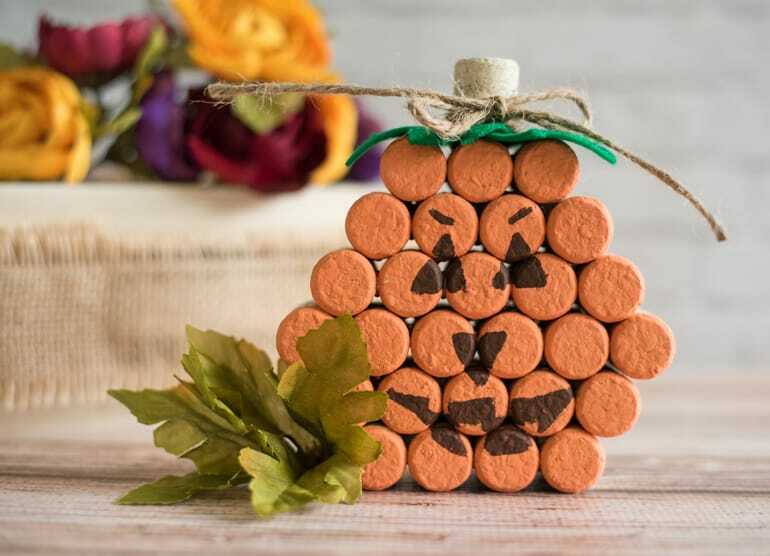 Once you have all 6 rows of corks glued together, it’s time to make your pumpkin! Dry fit a line of 5 on top of a line of 4 to see where you need to place the glue, then apply hot glue and adhere the two rows together. 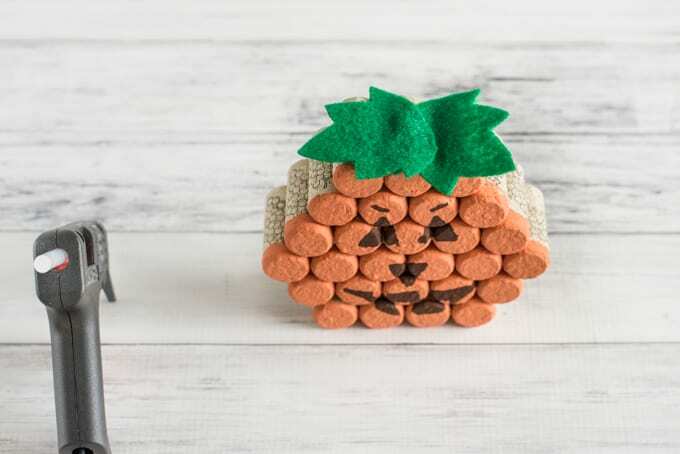 Continue this process until you’ve glued the entire pumpkin together! 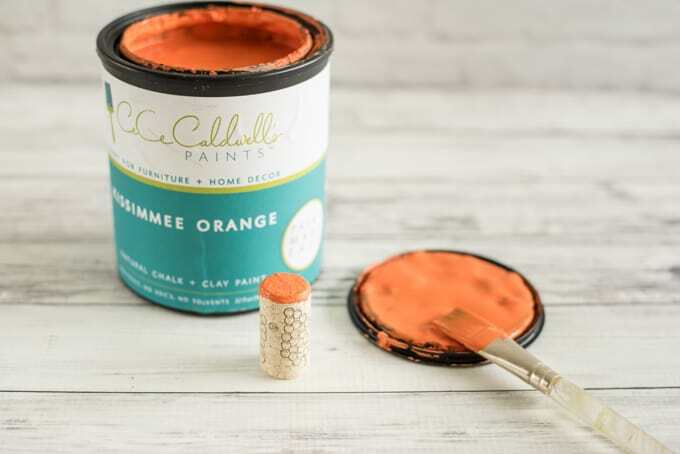 Then paint the design on. I used a dark brown instead of black, but other colors could work, too. 8. 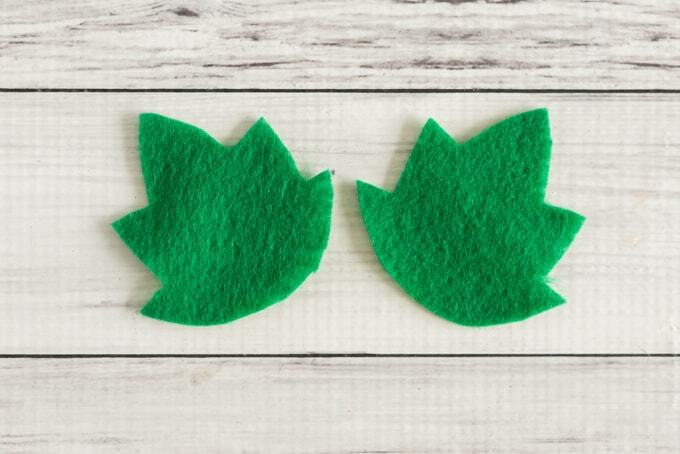 Pin or hold the pattern in place on your felt and cut two or three leaves. 9. Glue them in place on the pumpkin’s top. 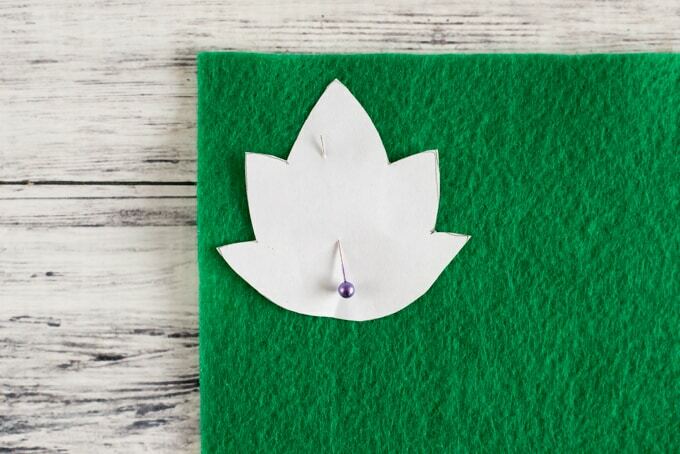 then glue it in place on top of the leaves. 11. After the glue has had a chance to set, you can wrap twine around the stem and tie a bow. 12. Enjoy your rot free jack o’lantern! This little cutie has been decorating our living room since the end of September, and we’re still loving him. It’s great to have a non-perishable jack o’lantern option when you live in a warm, humid place! Do you carve pumpkins? Or do you live somewhere they’d just rot on your doorstep before Halloween? That is so cute! but I would never have that many wine corks—hmmm . . . maybe my daughter would. That’s why I just buy them! We literally still have a bottle of wine left over from our wedding, so there’s no way we’d ever gather enough corks to make anything if we relied on personal consumption!